WHEN IT COMES TO APPLES, New England truly is a melting pot. In addition to the dozens of varieties discovered in the region, apples from across the country and around the world have flourished in New England’s climate and soils. We’ll be looking at the origins of some of New England’s best-known apples over the next several weeks. There are only a handful of active apple-breeding programs left in the United States, at Cornell University in New York, the University of Minnesota, Washington State University, and a joint program of the University of Illinois, Purdue University in Indiana, and Rutgers University in New Jersey, known by the acronym PRI. 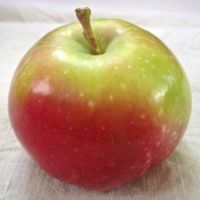 The PRI consortium has produced a number of cultivars that are grown in New England: early season apples Vista Bella (discovered in 1956; released commercially in 1974), Mollie’s Delicious (1948; 1966), and Pristine (1975; 1994), the mid-season CrimsonCrisp (1971; 2005), and the late-season GoldRush (1973; 1993). 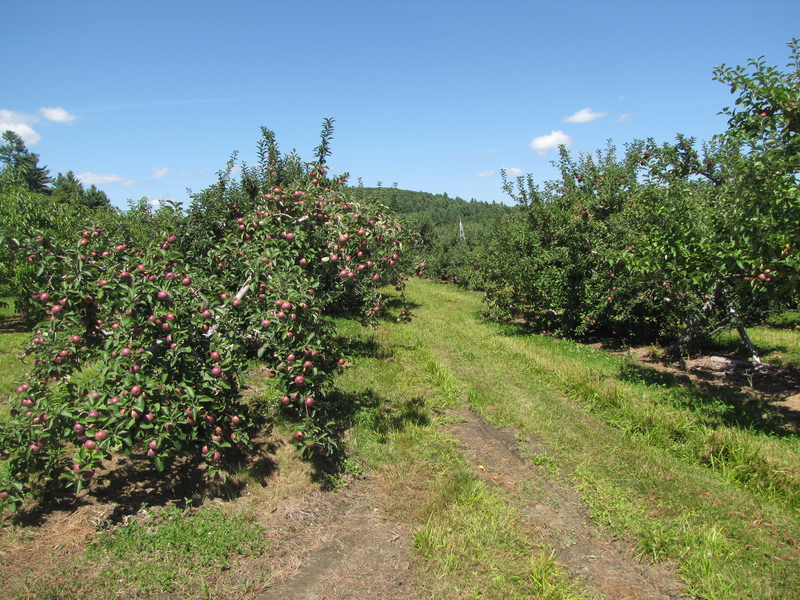 Two other early season apples developed by PRI are Jersey Mac and Williams’ Pride. Despite its name and resemblance, though, Jersey Mac’s complex parentage does not include McIntosh. It is a cross between Melba, Wealthy, Rome, and Starr, an obscure, yellow-green apple from the 1920s known for its tart, juicy flesh. Jersey Mac was developed in 1956 at the Rutgers New Jersey Agricultural Experiment Station in New Brunswick, and released commercially in 1971. Like Pristine, Williams’ Pride is an outstanding newer entry into the early season market, discovered in 1975 and released in 1988. 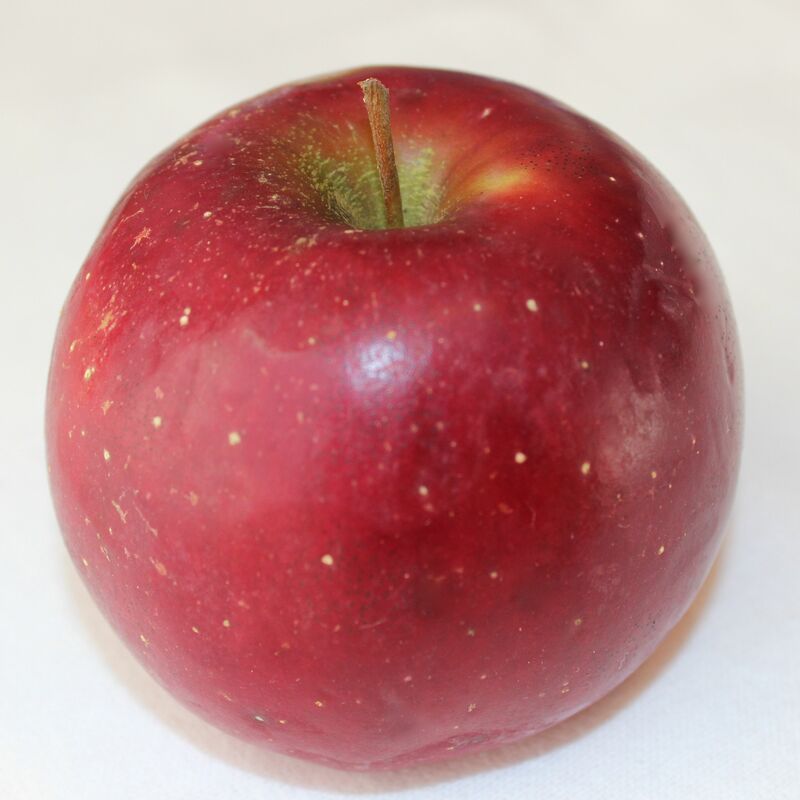 It is a medium-to-large apple, slightly conical in shape with maroon-red color. Its crisp, juicy flesh is cream-colored, and it has a spicy, nicely balanced, sweet-tart flavor. It is an all-purpose apple especially good for fresh eating. Like Jersey Mac, Williams’ Pride has complex parentage that includes Melba, Jonathan, Mollie’s Delicious, and Rome. It was named for Edwin B. Williams, long-time head of the disease-resistant apple-breeding program at Purdue University in West Lafayette, Indiana. Two late-season apples from PRI are Enterprise and Suncrisp. Enterprise is a round, medium-to-large apple, deep-red in color with prominent white lenticels. Its spicy flavor is more tart than sweet, and it is considered best for cooking. Its flesh, crisp at harvest, softens some in storage, and its somewhat tough skin develops a waxy coating, but it keeps exceptionally well. Discovered in 1978 and released in 1990, its parentage includes Golden Delicious, McIntosh, Rome Beauty. Another variety credited to Edwin B. Williams, Enterprise was developed for disease resistance at Purdue. It is immune to apple scab and highly resistant to fire blight and cedar apple rust. 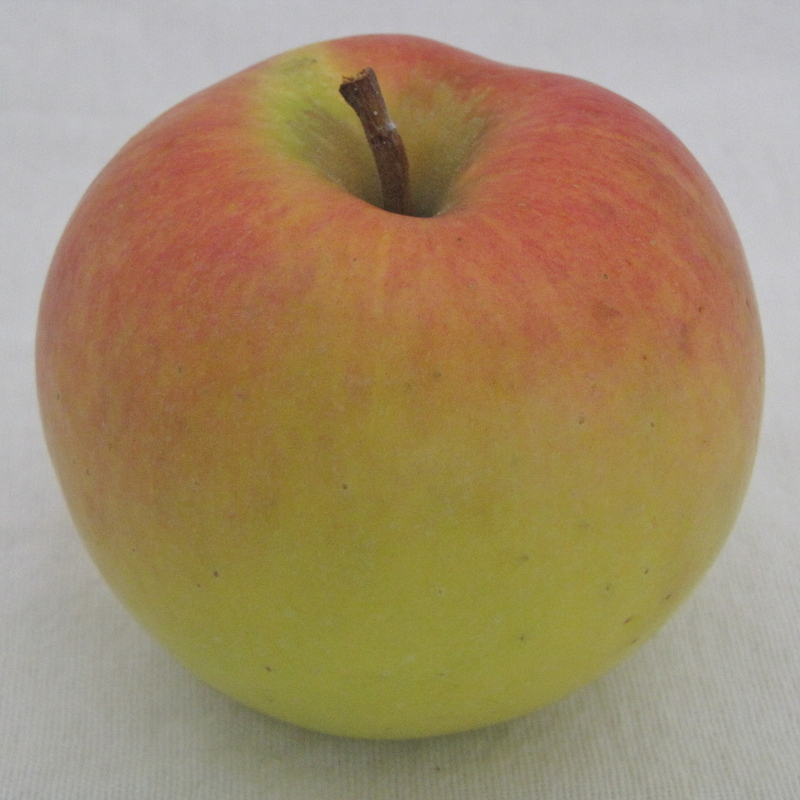 Suncrisp is a late-season apple that continues to develop its flavor long after harvest. 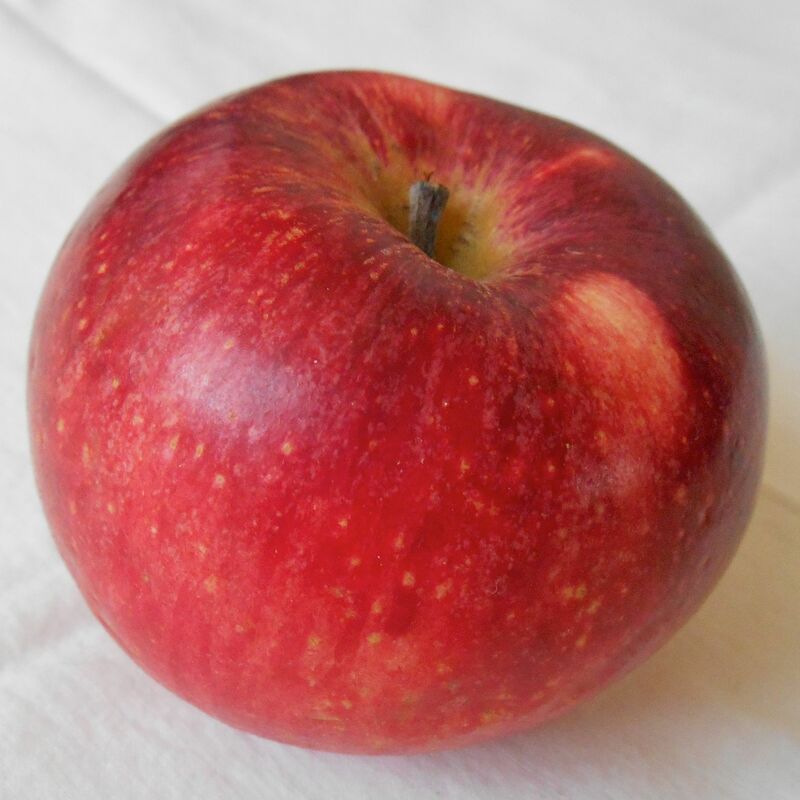 A large apple, it has orange-red striping over a yellow skin. Its cream-colored flesh is crisp and juicy. More tart than sweet when picked, it becomes sweeter and develops a complex, spicy flavor in storage, where it can keep for up to six months. It is especially good for cooking. Suncrisp was developed in the 1990s by Dr. Frederick Hough at the Rutgers New Jersey Agricultural Experiment Station in New Brunswick from Gold Delicious, Cox’s Orange Pippin, and Cortland parents. The Suncrisp name is trademarked by Rutgers University. WITH THE FRESH HARVEST upon us, here is a simple, straightforward, and delicious way to get those apple juices flowing. Adapted from From A Monastery Kitchen by Brother Victor-Antoine d’Avila-Latourrette. Preheat oven to 375°. Arrange apple slices in 9” round cake pan. Combine remaining ingredients except cinnamon and butter, and spread mixture loosely over apples. Stir cinnamon into butter and drizzle on top. Bake for 30-40 minutes until apples are done. Apples of New England: A User’s Guide (The Countryman Press) is now out! 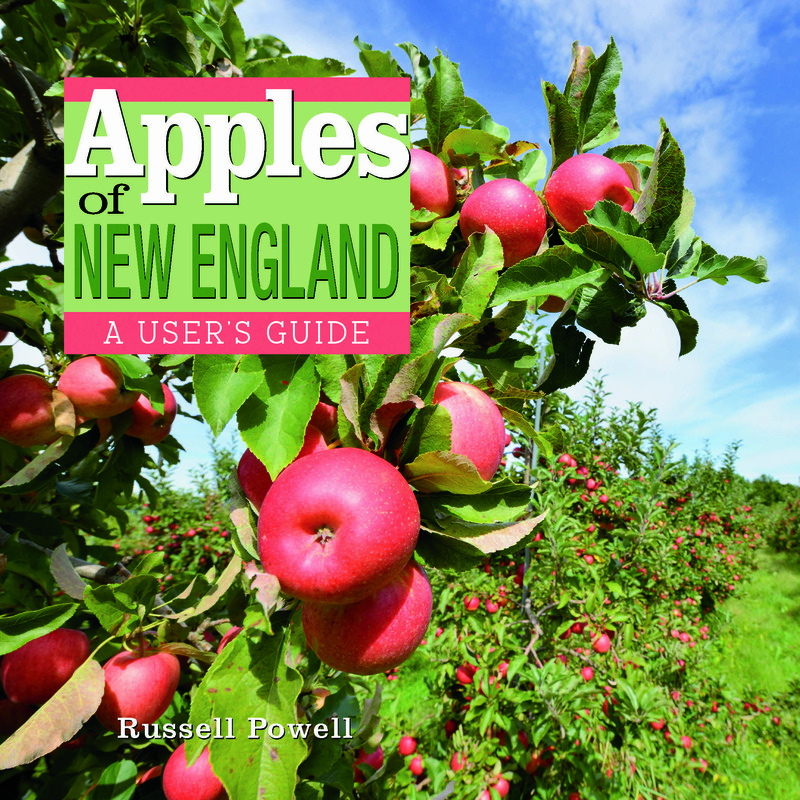 A new book by Russell Steven Powell, it features color photographs and descriptions of more than 200 apple varieties grown, sold, or discovered in New England, plus a history of apple growing in the region spanning nearly four centuries. Photographs are by Bar Lois Weeks, executive director of the New England Apple Association. America’s Apple is now available in paperback for $19.95. Visit Silver Street Media or Amazon.com to order online, or look for it at your favorite orchard or bookstore. I really look forward to Williams Pride every August.It’s a great early choice. Jersey Mac leaves me unmoved however. I would argue that Paula Red is the better early Mac-ish choice. I’m off to Farmers Market to get the latest. Thanks Adam. I’ve had two very good PaulaReds this week!